Widespread across northern South America. It’s native to Venezuela, Guyana, Suriname, French Guiana, Trinidad and Tobago, Peru and Brazil. Inhabits a variety of biotopes, including slow moving rivers, tributaries, oxbow lakes and ditches. Some of these contain clear water, while others have a lot of suspended sediment and are murky. Feeds chiefly on small invertebrates in nature. In the aquarium it proves unfussy. Feed a mixture of dried flakes and granules along with small live and frozen foods. It’s a very peaceful species that won’t compete well with very boisterous or much larger tankmates. Ideally keep it with other South American species, such as other Hemigrammus or Hyphessobrycon species, pencil fish, Apistogramma dwarf cichlids, Corydoras and small Loricariids. 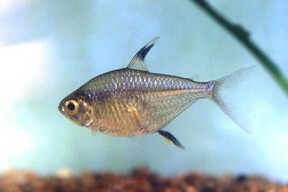 In a more general community it can be combined with smaller rasboras, barbs, Anabantoids and West African dwarf cichlids such as Pelvicachromis species. Despite its abundance in nature, this is not a commonly seen species in the hobby. When it is available, it’s usually only as a contaminant among imports of other species.